Tokyo is well known for it’s lights. Blaring ads that rival Time Square and soak up the power grid while doing it. Godzilla stomping on buildings while the Neon lights explode. But over at Panasonic Center, environmentally conscious designers are changing that high powered perception with a design that probably had a kid’s toy as it’s inspiration. 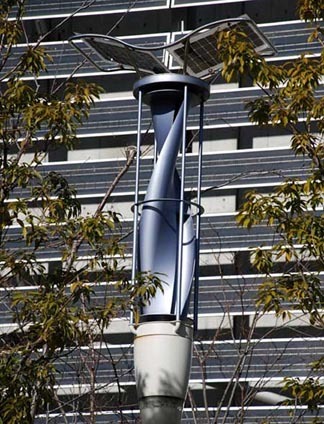 Designed with a combination solar array and wind generator, the streetlights around the building look like a pinwheel of sorts, and can charge either during a sunny or windy day. In fact, the lights can generate their own electricity even at night thanks to the solar turbines built into the post. Power is stored in the batteries that are stored in the base of the streetlight. What a great idea for cutting civic costs. So, rather than having the taxpayers fit the bill, why not have Mother Nature provide all the light? And Panasonic Center is the ideal place to showcase the idea as visitors to the center come to see the latest ideas in technology being developed by the company. In a time where city budgets are being slashed, here’s hoping that the idea catches on.